Sash Ninovic is the proprietor of AN Racing & Restorations. He has been tinkering with high performance cars, including Falcon GT’s for most of his life. At the age of 16 Sash spotted a Vermillion fire XY GT. After checking out the car and persuading the owner to sell, his first car was purchased. The standard performance of the GT Falcon was not exactly what Sash had imagined so the standard 351C engine was removed for some modifications. The engine was rebuilt by a reputable mechanic and raced at Eastern Creek back in 1992. The car’s first ever pass ran a 12.20 @ 112mph. After changing diff gears, installing a liberty top-loader gearbox and fitting larger slicks the ET dropped to 11.60 @ 116mph. The car was raced for 2 years with this combination. After this time Sash started to tinker with engines himself. This allowed him to conduct his own R&D with various combinations for customers as well as himself. This allowed Sash to collect valuable information and make his own assessments on combinations during this period. As a result the original 351C engine was sold to make way for a serious 351W. This Windsor would be purposely built to run the desired numbers….the faster, the better! In 1997 this engine was completed and Dyno-tuned at Dave Handley’s. This new engine made 620HP @ 7400RPM, showing 515ft-lb of torque at 4800RPM. A number of C4 transmission failures saw the engine being removed from the vehicle and a mild street engine was re-installed into the Falcon. The serious Windsor was then loaned to a friend who installed it into a very nice Sky View Blue XA-RPO Coupe. At full weight the XA measured in at a hefty 3500lbs. The car ran on it’s one and only pass producing a respectable 10.80 @ 122mph. This engine was then sold to fund a serious full chassis Super Stock drag car. In 1999 Sash continued to race in Super Stock, and as a result AN Racing was born… The XF was purchased and raced at various race tracks around the country. The first full pass with this car backed what the previous owner had been running: 8.72 @ 155mph. 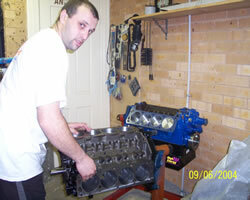 After racing the car for 12 months Sash decided to rebuild the engine and throw in a few ideas of his own into the mix. A new SVO block, new bore and stroke combination was envisaged. A new cam profile was chosen and a Peterson dry sump system was installed. Instant progress was made on its first pass and the car produced 8.56 @ 165mph. After battling in this very expensive bracket for a further 12 months Sash decided to sell the car and take a break from the race track. This enabled Sash to concentrate on customers cars and pay more attention to his street car. Sash now offers a wide range of services from comprehensive engine packages as well as servicing of your existing engine. If you would like to make any further enquires please feel free to contact us.